This page is designed to help researchers and people looking for research opportunities find each other. 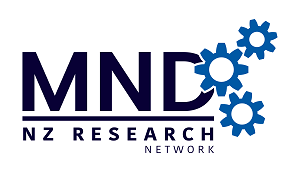 We want to make it easier for people to make MND their area of focus and hope that the advancements that come out of these projects will make a positive difference to the MND community. If you have a vacancy or are looking for a specific opportunity please contact us. The ALS Research Forum has a comprehensive list of funding opportunities available. The Neurological Foundation will accept applications designed to further the knowledge and treatment of primary ‘neuropsychiatric’ or ‘neuropsychological’ disorders, as long as the research takes a mechanistic approach to discovering or treating a component of the disorder. This is the main avenue by which the Neurological Foundation sponsors research. No set limit. As a guide approximately $1.3 million has been awarded in recent grant rounds. A grant will typically cover salaries for technicians, scientists or nurses, equipment, and working expenses. Applicants can be scientifically or medically qualified, and the research can be clinical or biomedical. Only one resubmission of a declined Project or Small Project application will be considered. Applications which deal only with the clinical management of mental health disorders will not be considered. Please note: Applications are required to be received on or before the abovementioned F&ST deadline to allow sufficient time for our Quality Assurance process and any associated rework/revision of the application by the Principal Investigator. Following on from QA, the F&ST will submit the application and the necessary hard copies on your behalf to the Funder. These grants are intended to encourage individuals with an interest in clinical neurology and/or the neurosciences to become involved in formal research and/or to undertake pilot studies which may seed a larger project. Up to $15,000. The grants may be used for salaries, equipment or working expenses, but NOT for travel. This Fellowship will be awarded to a medical graduate committed to a career in Neurology or Neurosurgery, to give them the opportunity of spending a period in clinical or biomedical research. This may be combined with advanced clinical training in neurology, but the research component should be at least 50%. Research can be clinical or basic science. The salary will be based on that which would have been applicable had the Fellow continued in a clinical post in New Zealand. • The award will not normally be taken up until at least the fourth year after graduation. The Fellowship will be tenable at an approved sponsoring institution either in New Zealand or overseas. The application must be accompanied by the formal written agreement of a senior member of the staff of the sponsoring institution to undertake the duties of supervisor of the Fellow’s work and director of their research project. There must be formal written agreement by the sponsoring institution itself to employ the Fellow, and to provide the facilities for the project. Successful applicants may also pursue a higher degree during this time (PhD, MD). Intending applicants should make themselves known to the Foundation well before the closing date (see below), so that details of the application can be discussed. Please note: Applications are required to be received on or before the above-mentioned F&ST deadline to allow sufficient time for our Quality Assurance process and any associated rework/revision of the application by the Principal Investigator. This Fellowship will be awarded to a New Zealand registered non-medical health professional who is committed to a clinical research career with a major focus on treatment or care of those affected by brain disease or injury, including end of life care. Salary for up to two years and up to $3,000 of return travel costs if applicable, but the provision of equipment and working expenses for research will be the responsibility of the Sponsoring Institution. With the approval of the Foundation the salary may be spread over a period of up to three years. Research conducted by the Fellow may be used towards the requirements of a higher degree (Masters or PhD). • Applicants should be New Zealand citizens or permanent residents who have a Bachelor or Masters degree, or other relevant professional qualification. The Fellowship will be tenable at an approved Sponsoring Institution either in New Zealand or overseas. Applications must be accompanied by the formal agreement of a senior member of the staff of the Sponsoring Institution to undertake the duties of supervisor of the Fellow’s clinical work and/or research. Brain machine interfaces are used to extract the neural code associated with a behaviour, and use that code to drive a robotic device. In the context of human health, it allows people with motor disabilities to have their brains ‘talk’ directly to a device, such as a prosthetic arm. The project involves understanding the models of auditory-vocal learning and vocal production, understanding how vocal motor commands are coded in ‘motor cortex’, how these can be analysed through machine learning algorithms, and animal behaviour analysis. Students with a background in biology, neuroscience, mathematics, engineering or bioengineering are encouraged to apply. We are currently trying to exploit this technology to study how auditory and somatosensory information contribute to the production of speech. We are using a song bird as an animal model because the neural substrates and the process of learning song are similar to those of humans. To separate the processes that are involved in the ‘intention’ to sing from the act of singing itself, we are training birds to learn how to ‘sing’ (through a brain machine interface) using an audio speaker rather than through their vocal apparatus.